Childe Hassam was second to Mary Cassatt among the American artists who were associated closely with Impressionism. He developed his style during this 3-year sojourn in Paris around the 1880s. He was an important artist in the context of 19th century art in America, and was a founding member of “The Ten,” a group of 10 American Impressionist artists led by John Henry Twachtman. 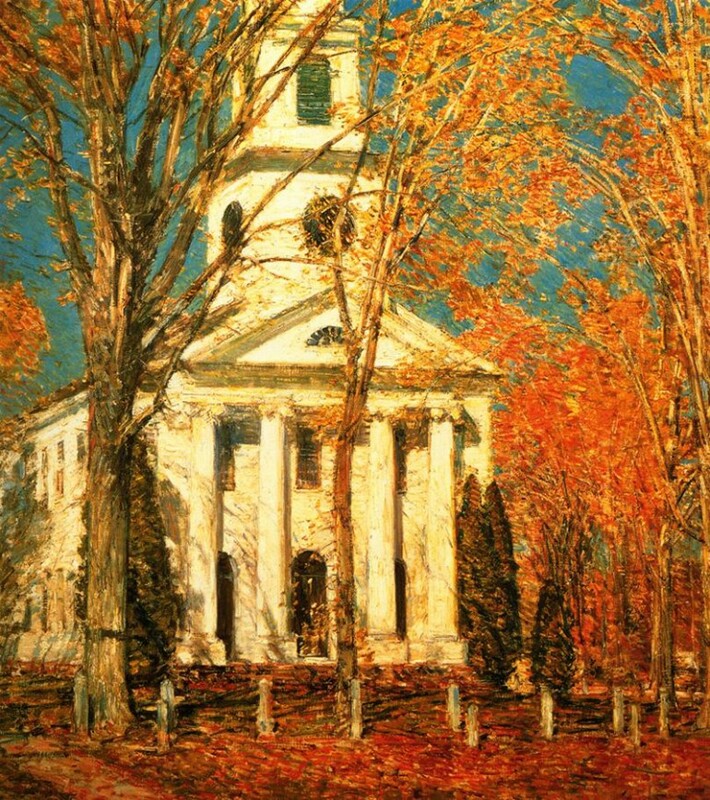 Other members included Willard Leroy Metcalf, J. Alden Weir, Edmund Tarbell, E.E. Simmons, Thomas W. Dewing, Robert Reid, Frank W. Benson and Joseph De Camp. William Merritt Chase took over the leadership upon the death of Twachtman in 1902. Hassam was known for his flag paintings and gardens that looked very lively with dappled light. But he was remembered the most for his cityscapes particularly the changing scenery in urban New York. Hassam was more versatile than his contemporary Impressionist artist friends, John Singer Sargent and James Whistler. Aside from painting, Hassam was also an accomplished illustrator and wood engraver. Later in life he mastered several printmaking techniques, including lithography and etching. Frederick Childe Hassam was born in Dorchester, Massachusetts on October 17, 1859. He was attending The Mather School when he received his first drawing and watercolor lessons. During the Great Boston Fire of 1872, which gutted the commercial district, including the cutlery business of his father, he dropped out of school. He was only 13 years old by then, and despite his uncle’s willingness to support his education, he wanted to help his family and worked in an accounting firm. While working Hassam also studied wood engraving. He was an adept student and quickly mastered the art and was soon creating commercial engraving designs for newspapers and letterheads. At age 20 he started painting mostly outdoor scenes in oil, but showed preference for watercolor. Hassam was a skilled draftsman and worked as a freelance illustrator doing book and magazine illustrations. He decided to enroll at the Lowell Institute to take classes in figure drawing and at the same time went to the Boston Art Club for figure painting lessons. In 1882, at age 23, Hassam held his first one-man show at Boston’s Williams and Everett Gallery featuring his watercolors. Because he felt the lack of formal training in art, Hassam embarked on a study trip to Europe in 1883 and went to Spain, Switzerland, Italy, France, Netherlands and Britain and studied the works of several Old Masters in different museums along the way, including the works of JMW Turner. He completed several watercolor paintings during his study tour and 60 of them were included in his second exhibition in Boston in year 1884. Childe Hassam went back to Paris in 1886 and took formal drawing classes at Academie Julian under the tutelage of Gustave Boulanger and Jules Joseph Lefebvre, but was particularly drawn to outdoor painting. He stayed in Paris for three years, which became the turning point for his painting career. When he was in Boston, he was using a darker palette, but when he got exposed to the art scene in Paris, his palette became lighter, very much like most of the French Impressionists. The change was clearly evident in “Grand Prix Day” that took a gold medal in the Paris Salon of 1888. Hassam became inspired by the paintings of Camille Pissarro, Renoir and Monet that were shown at art exhibitions and museums and emulated their style of using softer colors that were applied with free brush strokes. For his subjects, he leaned towards scenes with flowers, gardens and streets and even if he was a foreigner, his works were accepted in the annual Paris Salons when he was staying in Paris. He even received a bronze medal when four of his paintings were included at the Exposition Universale of 1889. Back from Paris, Hassam decided to move to New York to be closer to other painters, art collectors and art dealers. He quickly established a fine reputation in the city, painting seasonal views of parts of the city that made them very recognizable. 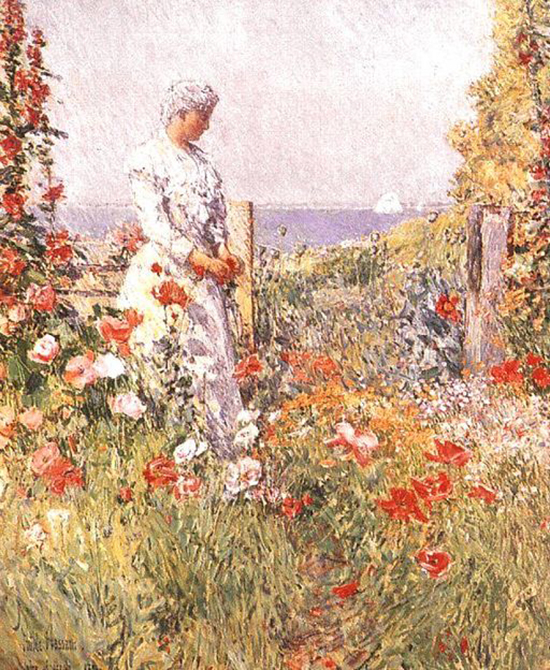 Hassam spent his summers at the hotel run by an old friend, Celia Thaxter, a gardener and poet. They were classmates when he was taking watercolor classes in Boston. He painted her in her garden in 1892 and did the watercolor illustrations for “An Island Garden,” Thaxer’s last published book of poems. In the 1900s, while still active in oil and watercolor painting, Hassam also devoted more time to printmaking and produced various coastal and harbor scenes that were similar to the paintings of James Whistler. Frederick Childe Hassam was quite a much honored artist and a wealthy man when he died at age 75. The American Academy of Arts and Letters was the recipients of all his surviving works, according to his will.